In the space of only decades, the continent of Antarctica has lost trillions of tonnes of its ice cover at alarming rates, even in places we once thought were safe. Now, a stunning new void has been revealed amidst this massive vanishing act, and it's a big one: a gigantic cavity growing under West Antarctica that scientists say covers two-thirds the footprint of Manhattan and stands almost 1000 ft tall. This huge opening at the bottom of the Thwaites Glacier – a mass infamously dubbed the "most dangerous glacier in the world" – is so big it represents an overt chunk of the estimated 252 billion tonnes of ice Antarctica loses every year. Researchers say the cavity would once have been large enough to hold some 14 billion tonnes of ice. Even more disturbing, the researchers say it lost most of this ice volume over the last three years alone. "We have suspected for years that Thwaites was not tightly attached to the bedrock beneath it," says glaciologist Eric Rignot from the University of California, Irvine, and NASA's Jet Propulsion Laboratory (JPL) in Pasadena, California. Thanks to a new generation of satellites, we can finally see the detail." Rignot and fellow researchers discovered the cavity using ice-penetrating radar as part of NASA's Operation IceBridge, with additional data supplied by German and French scientists. 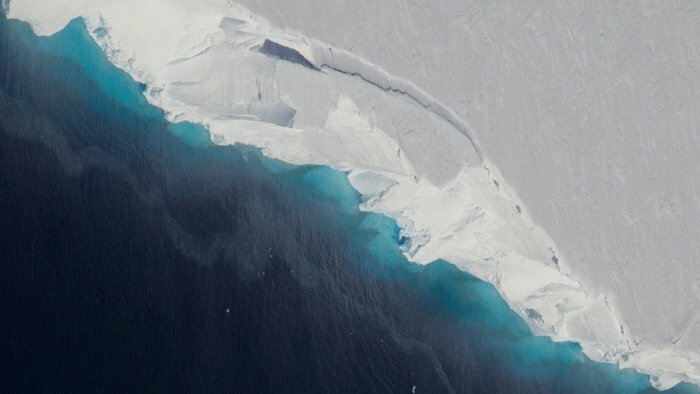 According to the readings, the hidden void is but one ice casualty among a "complex pattern of retreat and ice melt" that's taking place at Thwaites Glacier, sectors of which are retreating by as much as 2,625 ft every year. The complex pattern the new readings reveal – which don't fit with current ice sheet or ocean models – suggest scientists have more to learn about how water and ice interact with one another in the frigid but warming Antarctic environment. "We are discovering different mechanisms of retreat," first author of the new paper, JPL radar scientist Pietro Milillo explains. "[The size of] a cavity under a glacier plays an important role in melting," Milillo says. As more heat and water get under the glacier, it melts faster." That's important to know, since Thwaites currently accounts for about 4 percent of global sea level rise. If it were to disappear entirely, the ice held in the glacier could lift the ocean by an estimated about 2 ft. But that's not even the worst-case scenario. The Thwaites Glacier actually holds in neighboring glaciers and ice masses further inland. If its buttressing force disappeared, the consequences could be unthinkable, which is why it's considered such a pivotal natural structure in the Antarctic landscape. Just how long it will stay, nobody knows – which is why scientists are right now embarking on a major expedition to learn more about Thwaites. What they'll find remains to be seen, but it's inarguably among the most important scientific research being conducted in the world right now.